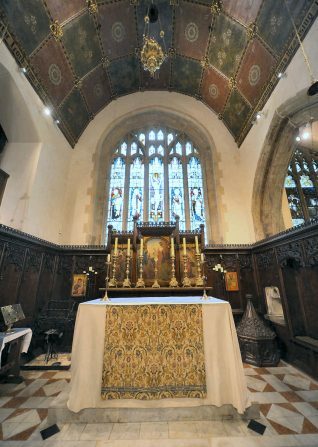 The beautiful east window in the sanctuary is the work of Charles Eamer Kempe. Kempe was born on June 29th. 1837, at Ovingdean Hall, near Brighton, the fifth son and youngest child of Nathaniel Kemp, Charles adopted the older spelling of his surname later in life. He was a cousin of Thomas Read Kemp, the politician and property developer responsible for the building of Kemp Town. 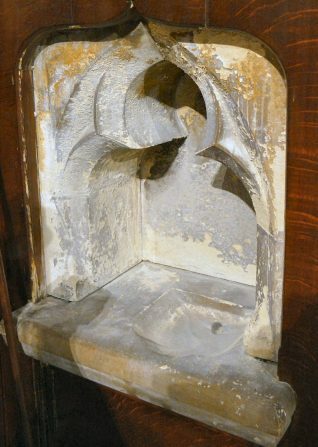 Many of the Kemp family are interred in St Nicholas, and this window was a memorial to them. 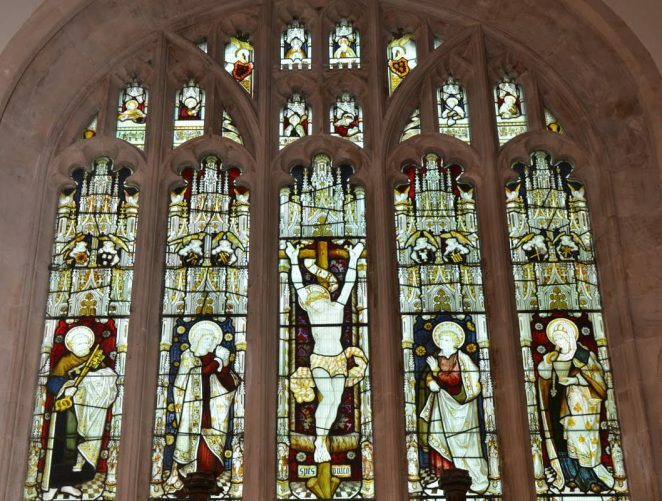 The subject of the window is Christ’s crucifixion and can be seen as the culmination of the ongoing theme of the life of Christ depicted in the windows on the north and south walls of the church. 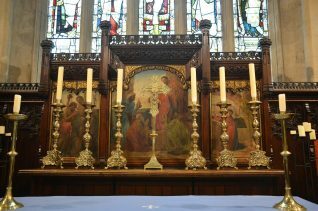 The sanctuary has wooden panelling with elaborate blank tracery designed by Somers Clarke and incorporates a triptych by Matthew Ridley Corbet(1850-1902) as the reredos; On the left of the high altar is an icon of the Madonna and Child and to the right is an icon depicting St Nicholas. 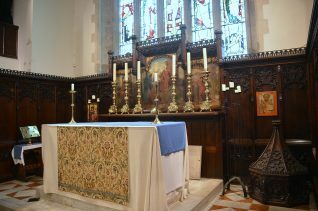 On the right of the altar is the piscina; a shallow basin which was used for washing the communion vessels; it was connected by a pipe directly to the ground. Cleaning the vessels in this basin ensured that any remaining consecrated particles were returned directly to the earth. The sanctuary floor is composed of coloured marbles.